I hate to break it to you, Spa-Francorchamps, but if anyone should be mad about the car named after any piece of their racetrack, it's Sebring. Not you. You get the totally insane GT-R-engined Infiniti Q50 Eau Rouge. Embrace it. But lo and behold, as Nissan Motor Company seeks to trademark the Eau Rouge designation for one of the coolest concept sedans around, Spa-Francorchamps would like to block that trademark. In an interview with Bloomberg, Circuit director Pierre-Alain Thibault said, "It's like they want to steal the brand from the circuit, We consider it exactly the opposite of fair play." Nissan also applied for the "Eau Rouge" trademark in Japan. In response, the circuit got a European Union trademark for the name in April. If the trademark is just for the sedan's name, this seems a bit overkill. Cars get named for racetracks all the time. Outlines of the Nürburgring even appear on the new Viper. Some of these trims are awesome, such as the Ford Mustang Boss 302 Laguna Seca or the BMW M3 Lime Rock Park Edition. Others, not so much. The Pontiac Le Mans, for example, started off as the car you got if you couldn't talk your parents into a GTO and ended its nameplate life as a rebadged Daewoo—OUCH. Spa, you have nothing to worry about. The Q50 Eau Rouge is insane in a lovable way, and it's even already been on Eau Rouge, far before anyone in the general public can even buy it. No posin' here. 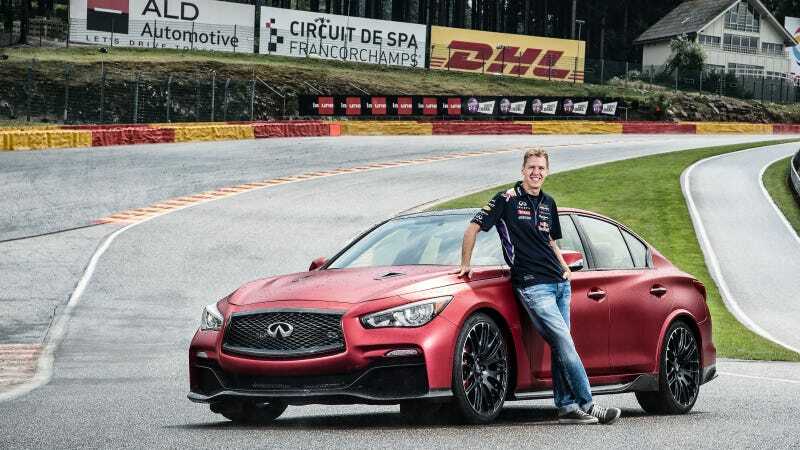 Absolutely no one is going to think of an Infiniti first when they hear "Eau Rouge." They're going to think of the most famous corner in Formula One. Besides, considering all the people who get the location of Eau Rouge wrong, I really don't think the biggest threat to the famous corner's "brand," "image" or whatever is a performance-oriented sedan. Its biggest threat seems to be other racing fans.